Are Wheat Taco Shells Better for You Than Corn? Are Caramel Apples Gluten Free? 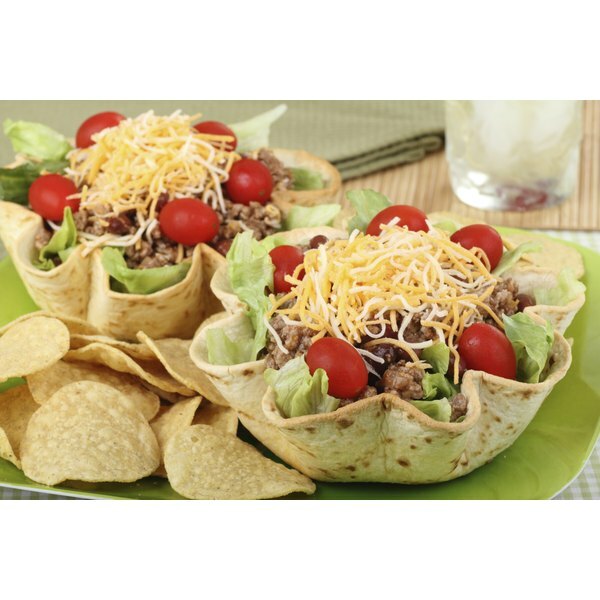 Taco salads combine meat, beans, cheese, lettuce and tomatoes in a crunchy taco shell bowl. If you have celiac disease and follow a gluten-free diet, you can eat meat, beans, cheese and produce without risking a negative reaction. However, you should be cautious and evaluate the type of taco shell that will be served with the salad. Some tortilla shells contain gluten and will put you at risk of having a reaction. A major reason you might wish to avoid gluten is if you have celiac disease. Celiac disease is an immune disorder in which your body is sensitive to gluten. When you eat gluten, your body attacks the lining of your small intestine, causing abdominal pain, weight loss, gas and diarrhea. While there is no cure for celiac disease, you can manage your symptoms by avoiding foods that contain gluten. Gluten is a protein found in wheat, rye and barley. If you should avoid gluten, avoid breads, pasta, cereal and tortillas made from these grains. According to the National Digestive Diseases Clearinghouse, a variety of processed foods may also contain gluten, such as hot dogs, cold cuts, french fries, matzo, soups and flavored potato chips. Because food manufacturers include gluten in processed foods, you should take care to check the nutrition labels on the products you buy on a regular basis. Flour tortillas contain white or wheat flour. During the process of making tortillas, the chef kneads the dough, which develops the gluten even more. After the tortilla is cooked, it is then deep-fried in a bowl shape. Before you order a taco salad at a restaurant, ask if they prepare the salad with a flour tortilla shell or a corn tortilla shell. Corn tortillas are a staple for a gluten-free diet. You can deep-fry corn tortillas into a bowl-shape at home for a gluten-free taco salad. If you are eating at a restaurant, ask your server if they offer a corn tortilla bowl in lieu of a flour tortilla shell. If they do not, request the taco salad on a plate without the tortilla shell. You can sprinkle crushed plain corn tortilla chips on top to add crunch.